From Tamashii Nations. 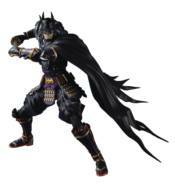 An action figure of Ninja Batman, from the hit Japanese anime of the same name! Includes a Japanese katana, kunai throwing blades, the removable cape is posable to enhance Ninja Batman's dramatic silhouette. Display it with the Joker (sold separately in July) to recreate the world of Ninja Batman! Includes optional hands and an optional head.